Scotland’s landmark legislation for smoke-free enclosed public spaces, enacted ten year ago today, has saved the Scottish adult population from breathing in over half a tonne of toxic material, according to new research. Health campaigners Action on Smoking and Health (ASH) Scotland worked with academics at the University of Aberdeen to calculate what ten years of cleaner air has meant for people in Scotland. Smoke from other people’s cigarettes is called second-hand smoke. It contains more than 4,000 chemical compounds, at least 250 of which are known to be toxic or to cause cancer. Of particular concern are the smallest particles, called PM2.5, which are invisible to the human eye but can linger in the air for hours and travel deep into the lungs. Detailed measurements before and after the smoke-free legislation showed the PM2.5 levels inside Scottish pubs decreased by 86 per cent when smoking was moved outside. Along with existing knowledge of how much air adults breathe, and how much time Scottish adults spend in a pub, this means the change in the amount of PM2.5 breathed in can be totalled over the ten year period. Crunching the numbers the researchers were shocked to find that, taken as a whole, the adult Scottish population has inhaled at least 600kg less of these tiny toxic particles because of smoke-free pubs – that’s over half a tonne of a material known to cause cancer. Given that this figure only relates to time spent in a pub, the additional benefits from smoke-free cafes, restaurants and offices mean the actual reduction in inhaled toxins is likely to be even higher. Dr Sean Semple of the Scottish Centre for Indoor Air at the University of Aberdeen said: “Scotland’s introduction of smoke-free public spaces was one of the most closely-studied pieces of public-health legislation ever, allowing us to look very carefully at the impact it had. We have known for many years that second-hand smoke is harmful, but I don’t think anyone predicted just how much benefit smoke-free places would deliver. 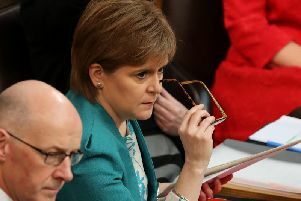 “This calculation shows that over half a tonne of toxic material would have been inhaled by the population over the past 10 years if Scotland had not taken this bold step. Sheila Duffy, Chief Executive of ASH Scotland, said: “The cultural impact of smoke-free public places has been profound, with a new generation growing up with smoke-free environments as their right and their expectation. On top of that the intended health benefits have been surpassed, with today’s new figure helping to explain why asthma and heart attacks have decreased so much.